A friend gave me this recipe for pear and ginger cupcakes many years ago. It is actually a vegan recipe as it is dairy and egg free. I am not a vegan but I love it. Add eggs and vegetable oil to the small bowl of an electric mixer and beat until well combined. Gently fold in the pears and ginger. Sift together the flour, baking powder, ground ginger and nutmeg. Fold dry ingredients and sugar into the egg mixture until well combined. Spoon mixure into cupcake trays. Bake for 15-20 minutes or until a skewer inserted into the center of a cupcake comes out clean. Leave in trays for a couple of minutes before turning onto a wire rack to cool completely. Dust with confectioners (icing) sugar. 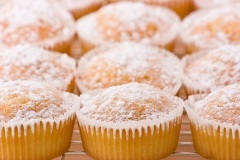 Thanks so much for sending in your recipe for pear and ginger cupcakes. My mom loves ginger so I think I will be making these for her birthday next week. I suppose you could replace fresh pears with tinned or bottled if they are not in season. I might give it a try.